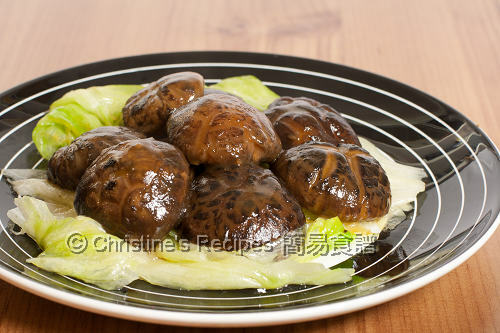 One of the must-eat dishes for Chinese New Year celebration is this braised shiitake mushrooms in oyster sauce dish. The shiitake mushrooms are meaty, smooth and delicious. I often follow my mum's trick to make this dish even more appealing and shiny. Just a little bit of rock sugar will do the trick. I easily associate this braised shiitake mushrooms with all traditional Chinese festivals, like Winter Solstice (冬至), Chinese New Year’s Eve, as my mum used to cook it on these occasions. During my childhood, when I saw this dish served on our dinner table, I’d feel that we’re enjoying a luxury meal simply because mushrooms were quite pricey at that time. Although big and best quality shiitake mushrooms are still very expensive now, we can get smaller ones with good quality at much cheaper price for substitute. We are quite satisfied with their texture and taste. My mum’s braised mushrooms are the family’s most favourite. Her braised mushrooms were incredibly velvety and shiny. The simple trick she used is to add a little block of rock sugar, about thumb size. On a side note, she won’t compromise in using second grade oyster sauce whenever she cooks this dish. It’s a great pleasure in tasting every bite of her mushrooms, in fact, it’s very addictive. As usual, I cooked this dish on the day of Winter Solstice, followed my mum’s way. The dish I cooked isn’t as good as my mother’s, but our family was rather satisfied with the end result, that was very delicious. And I’m going to make this dish again on Chinese New Year’s Eve for sure. Rinse mushrooms and soak in water for about 30 minutes, or until soft enough that you can trim the stems. Rinse away any dirts or impurities. Change clean water and continue to soak until mushrooms completely softened. Drain out the mushrooms. Save the soaking water for later use. Use a handful of cornflour to mix with the mushrooms and rub with your hand. Set aside for 15 minutes, then rinse. Use a deep pot, add the mushrooms, soaking water, rock sugar and a few drops of oil. Cook over medium-high heat. Bring it to a boil. Reduce heat to low and simmer until water dries up and thickens. Add more water if necessary along the way. Pour in the seasonings and stir to combine. Taste by yourself. Season with soy sauce or sugar if needed. Meanwhile, blanch lettuce in boiling water with a bit of oil for 1 to 2 minutes. Don’t overcook, it should be a bit crunchy in texture. Drain well. Transfer on a serving plate. Arrange the mushrooms, and ladle sauce on top. Serve hot. The bigger mushrooms would be better, but more expensive. But you don’t have to buy those expensive ones. Those smaller ones are of budget choice. Don’t go for those with thin flesh though. Try to choose the ones with thicker flesh, in shiny black colour. Normally, they come in sealed plastic bag. But if you have any chance, smell some samples before you buy. If the mushrooms smell sweet fragrance, they are of good quality. By adding a small block of rock sugar, the braised mushrooms become shiny. By rubbing the mushroom flesh with a bit of cornflour, then rinse, it helps to make the flesh smoother and velvety. 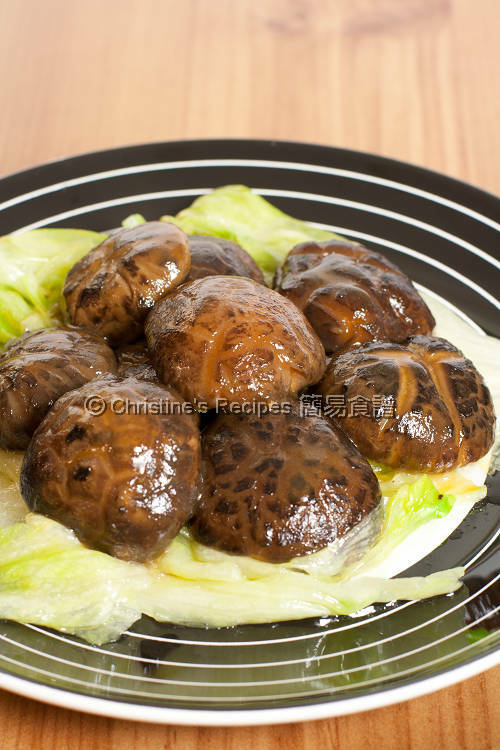 I love this delicious mushrooms, a must cook for CNY. My mom always cooks this dish for CNY. Yum!! Happy New Year, Christine! Also one of our most adorable homemade dishes for the festive seasons. Wish you a happy, healthy 2010! delicious looking..yeah.how can we miss out mushrooms on cny? Your mushrooms look so soft and puffy..mmm delicious! This looks so delicious! Thank you for sharing such a wonderful memory and delicious recipe. Do you think I can use fresh shiitake mushrooms, instead? The fresh mushrooms are very tender and plump, but I've noticed the flavor of fresh mushrooms that we get in the States are not as intense as the dried ones that I buy from the Chinese market, so I'm not sure how the dish will turn out. Also, when do you add in the oyster sauce - during the braising part, or during the seasoning part? You can use fresh mushrooms instead. As you know, the fresh mushrooms are very tender and soft, so you don't need to soak them, or cook them for too long. Just rinse and briefly cook them with the seasonings, add a bit more water if necessary. The flavor of fresh mushrooms that we get here, are not as intense as the dried ones as well. But the texture is very smooth and delicate. Thanks for dropping by. Welcome you come back. Simple and delicious....yum. I love these type of mushrooms. They are just so flavourful. Hi I would braised a whole lot and freeze in portions for later use.Can't do without these delicious morsels for CNY. Indeed. Reminds me of Chinese New Year too! Great way to enjoy shiitake mushrooms! The oyster sauce is a nice touch! Are you asking if this blog has a fan page? Yes. A widget was installed on the sidebar, or you can click here to join. I will be cooking this dish for this coming Chinese New Year. What brand oyster sauce to you use? Thank so much for all the wonderful recipes. I just made this and it is delicious! Just like in the chinese restaurants! Another fantastic recipe from you. Thanks so much for sharing the recipe Christine! can i use regular sugar instead of the rock sugar? Regular sugar can't produce the shiny effect as the rock sugar does. Great dish, did it today!Thanks. Thanks for trying my recipe and your kind words. Thanks so much for your love of my recipes. I also like to have fresh mushrooms too. They are quick to make. Mushrooms go really well with many different kinds of veggies. They are so versatile. Happy cooking and Merry Christmas. Do you know why rock sugar produce the shining effect on the mushrooms? Thanks so much for sharing this recipe and all the useful tips. I love this dish as my elderly mum would always request for this dish whenever we have family dinners at home. May I know the purpose of rubbing corn flour on the mushrooms? I learnt to cook this classic Chinese dish from my mother. Rubbing a bit of corn flour on the mushrooms is her trick to make the mushroom texture smooth and crisp. Thanks Christine for sharing! I have gained a useful tip. In the same manner, I can also use the same trick to marinate meat in other dishes. Hi Christine, I intend to cook this tomorrow. But my family is vegetarian tomorrow, can I substitute Oyster sauce with dark soya sauce? Or what do you suggest? It's my first time cooking this! Thanks for your help! Yes, dark soya sauce is good. Feel free to modify the recipe to suit your family's special dietary needs. The mushrooms could've been turned bad. I'm thinking of making this for thanksgiving dinner next week. I don't have rock sugar. Do you think maple syrup would work? Hi, maple syrup won't work for this recipe. You might skip the rock sugar then. Or add a bit of raw sugar if you have some. I used turbinado sugar and it turned out great. Thanks for the suggestion. Good to know that turbinado sugar works. So happy for you. The recipe was wonderful thank you Christine. I added a little grated ginger to mine as well. I'll be making this again for sure!